On June 26, we celebrate the probable birthday of blues legend Big Bill Broonzy. As is the case with many early blues players, such as Lemon Jefferson, the exact date of his birth is disputed; Broonzy himself claimed to have been born in 1893, but family records stated a more probable date of 1903. There is also mystery surrounding his place of birth, while Broonzy stated his hometown as Scott, Mississippi, recent research suggests he may have come from Arkansas. Whatever the true details may be, Big Bill grew up in Pine Bluff, Arkansas, and learned from his uncle to play a homemade cigar box fiddle, which he played at local social functions. In 1920, as many Southern black people did at the time, Broonzy emigrated to Chicago in search of new opportunity, where he switched from fiddle to guitar, mentored by Papa Charlie Jackson. In Chicago, Broonzy worked odd jobs while trying make it as a musician. In 1927, he got his break when Charlie Jackson helped him l get an audition with J. Mayo Williams of Paramount Records, and after several rejected tests, made his first released records with his friend John Thomas as “Big Bill and Thomps”. Though his records sold poorly for the first few years, sales eventually began to pick up as he gained popularity in the Chicago blues scene in the 1930s, even playing in John Hammond’s From Spirituals to Swing concert at Carnegie Hall in 1938 and ’39, with his style evolving from his rural roots to a more urban style all the while. Throughout the 1930s and 1940s, Big Bill recorded steadily, both solo and as an accompanist. In the late 1940s into the 1950s, Broonzy became a part of the folk music revival occurring at that time, and he toured abroad in the 1950s, starting in Europe in 1951. His autobiography, written with the help of Yannick Bruynoghe, was published in 1955. Broonzy died of throat cancer in August of 1958. 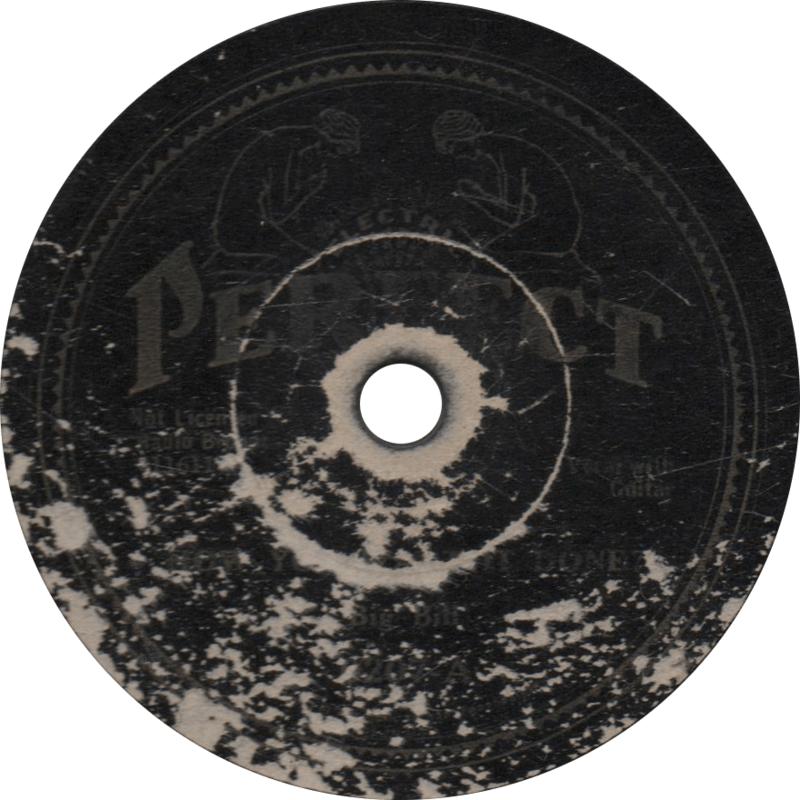 Perfect 0207 was recorded March 29 and 30, 1932 in New York City, at Big Bill’s first and second session for the American Record Corporation under his own name (excepting some 1930 recordings under the name Sammy Sampson and as a part of the Hokum Boys). The Jug Busters side features W.E. “Buddy” Burton on kazoo, piano by Black Bob Hudson, and Jimmy Bertrand on washboard. The identity of the jug player is unknown. “How You Want it Done?”, recorded March 29, is a fantastic side with stupendous flatpicked guitar by Big Bill, an unusual method for blues playing. It’s likely that Broonzy picked up this song, along with its flatpicking style, from his contemporary Louie Lasky, who later recorded it in 1935, though Bill recorded it earlier. Big Bill first recorded this song in 1930 for Gennett, then for Paramount in ’31 (of which no copies have been located) This recording was also featured on the last record in Vocalion’s race series (1745). It remained in Broonzy’s repertoire for many years, and he was filmed performing it in 1957. How You Want it Done?, recorded March 29, 1932 by Big Bill. 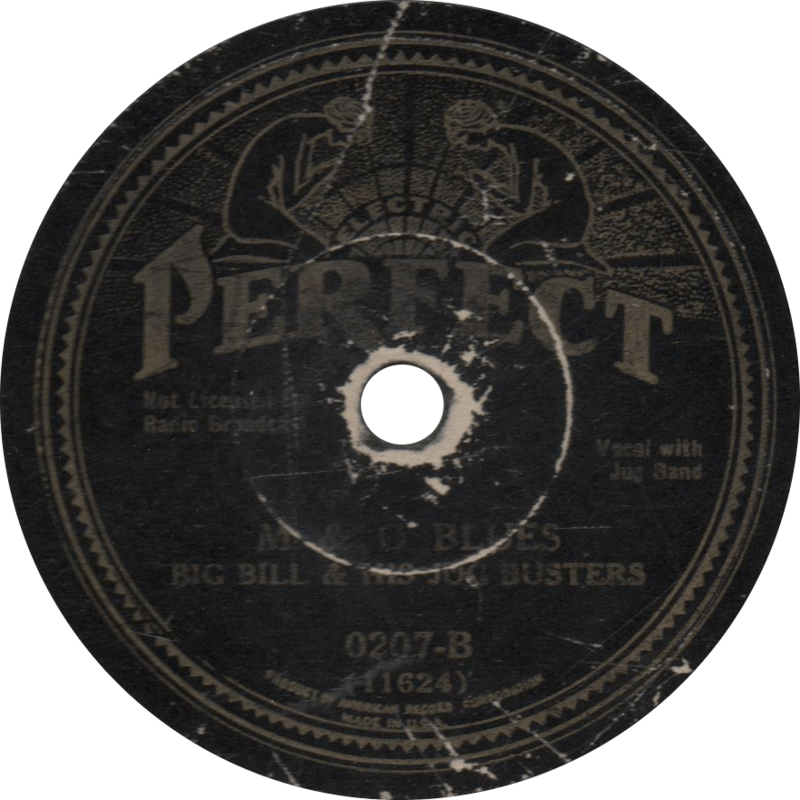 Recorded one day after the first side, Big Bill is accompanied by a jug band on “M & O Blues”, referring of course to the Mobile and Ohio Railroad. The authorship of this song is often credited to Walter Davis. It’s worth noting that there was another “M & O Blues” sung by legendary Delta bluesman Willie Brown which was an entirely different song. Though the label looks prettier, this side unfortunately has some pretty bad stripped grooves that make a lot of noise in brief but quite intrusive passages, but it does clean up a bit as it plays. Heck, the Document Records transfer is quite noisy, so cut me a little slack! M & O Blues, recorded March 30, 1932 by Big Bill & his Jug Busters. Updated with improved audio on June 21, 2017. This entry was posted in Records and tagged 1930s, 1932, ARC, Big Bill Broonzy, Black Bob, Blues, Jimmy Bertrand, Jug Band, Louie Lasky, New York, Perfect, Race Record, W.E. "Buddy" Burton by R. Connor Montgomery. Bookmark the permalink.